Every day social workers are in the trenches of difficult jobs, facing obstacles, fighting for justice, and making a real difference in their communities. While they give of themselves tirelessly day after day, their efforts often go underrecognized. That's why we created the "Dedicated & Deserving Social Worker" forum. 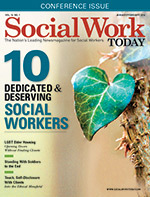 Each year we ask you, our readers, to nominate social workers who are deserving of recognition for their dedication to the profession. We're honored to share the stories of the 10 finalists with you here. Gary Bailey was on track to go to medical school when he says a "light went off in his head." He was attending a class taught by a social worker and came to the realization that he was on the wrong path. Once he learned about the field of social work he said he simply knew, "That's me. That's who I am." Since that epiphany, Bailey has gone on to dedicate himself to the improvement of the conditions of the elderly, youth, persons with HIV/AIDS, families, and women. He says his work with HIV/AIDS patients was born out of the tragedy of watching his friends die. "It was the early days of the epidemic and young person after young person was succumbing to this disease," Bailey remembers. "I felt helpless. We all did. We didn't really know much about the disease at that point and patients were kept in total isolation. I remember going to visit a friend and finding his meal outside his room because the nurses wouldn't take it in. People were terrified—you might liken it to Ebola today." Bailey says he knew he had to do something. He immersed himself in fundraising and activism and was the first black president of an AIDS service board in the United States. Since then, he's gone on to hold numerous leadership roles and accept many honors and awards. Bailey is a past president of NASW and was declared a Social Work Pioneer by NASW in 2005, making him the youngest individual to receive this honor. But Bailey has remained humble. He says he felt he was a "work in progress" when bestowed that honor and felt humbled to be in the company of pioneers who went before him, such as Jane Addams and Whitney Young. Today, as someone who is looked upon as a mentor and a leader, Bailey says he feels the "obligation to speak the truth." He is shaping the youth—and future social workers—as a professor. But he remains active in keeping his voice heard—particularly in the war on black men's lives, an issue he simply will not stand by and be silent about. "I live my life by two quotes," Bailey says. "The first is, 'I came into this world to live out loud,' said by Emile Zola. The second is a quote from Angela Davis. She said 'I'm no longer accepting the things I cannot change. I'm changing the things I cannot accept.' Those are words that I live by." Had you told Yolonda Carson in college that she was going to wind up in social work, it would have been a major surprise. At the time she was pursuing—and ultimately finished—an undergraduate degree in finance. While she did well in the field, she knew she just didn't have a passion for the work. What did bring her joy was the opportunity to provide financial counseling to individuals in need of utility and rent assistance. Though her job at the time was director of finance, Carson found herself enjoying the helping component of "other duties assigned" much more than the actual job duties associated with the financial piece of her job. That led her to a big decision. "I applied for both my MBA and my MSW, thinking the MSW was a long shot since all of my background was finance," Carson says. "But I ended up accepting a spot in an MSW program in 2001 and the rest is history." At the time, Carson admits she didn't realize the scope of the field. By chance, she fell into working in mental health—specifically with kids. Currently, Carson works at the Niles Home for Children, a residential treatment and day treatment facility for traumatized youth, ages 6 to 17 in the urban core of Kansas City, MO. Among her certifications, Carson is certified to provide trauma-informed care instruction. "It's hard work," Carson admits. "But what keeps me going is when youth come back and I see that I really did make a difference in their life. They always seem to come back at just the right time—the time I feel drained or like I'm hitting a wall. Then a former youth returns and I'm able to see that things have come full circle. In this field, you don't always see that end result, but when you do, it goes a long way in restoring your energy." Carson also works with parents through the implementation of her Parent Empowerment Program. Utilizing the "Love and Logic" curriculum and in partnership with the Children's Trust Fund, Parent Empowerment educates up to 60 parents annually. Carson says at least one-half come via the court system. "Parents often come in with arms folded really tight and glaring at me, but over the course of relationship-building it becomes clear that I'm just here to help," Carson says. "It's incredibly rewarding to watch the evolution from glares to looks of interest. At the end of the day, I just want to be someone who imparted a little bit of wisdom or helped make a difference in some way." Arriving in Miami in his early 20s from Uruguay, Manny Fernandez-Jacobs didn't speak any English and found himself in a city packed with many other immigrants. He says that early on, this had "awoken his spirit to social justice." He was able to work two jobs—one full-time and one part-time—while attending school at night. He ultimately pursued a master's degree in social work and was led to working with kids. "Early on, I volunteered as a voice for neglected children," Fernandez-Jacobs says. "My first case was a three-month old baby girl who had fractured her head. The mother was experiencing postpartum depression and everything was pointing toward her having done it. That incident made me realize how fragile children are. That baby needed someone to stand up for her and that person was me. From there on, I knew I wanted to pursue working with children and families." For the past 10 years, Fernandez-Jacobs has worked at the Miami-Dade Juvenile Services Department, serving as the licensed clinician in the Juvenile Assessment Center's Intake and Assessment Unit during the overnight shift. In this capacity, Fernandez-Jacobs works with high-profile juvenile cases. Though Fernandez-Jacobs says the work can be challenging and sometimes even frustrating, it's also incredibly rewarding. But he says that social workers don't get to be complacent. "My feeling is that if you've become comfortable in the job, you're not doing a good enough job," Fernandez-Jacobs says. "In this profession, we don't get to relax and become a spectator. The people we represent cannot advocate for themselves and we must always be at our best for them." Though Fernandez-Jacobs is going to retire from the County in the next two years, he says he will "never retire from social work." "I love social work much too much to retire," he says. "I teach a class at college for divorcing parents and I would love to continue that. I definitely hope that my future includes more teaching opportunities." A key component of Julia Grimm's job working with children who have experienced abuse and neglect is to conduct forensic interviews, trying to get as many pertinent details as possible to help law enforcement perform successful investigation. In working with these kids, Grimm also provides trauma-focused cognitive behavioral therapy. Though she sees some incredibly difficult cases, Grimm says the kids keep her going. "There is something really humbling about being one-on-one with a child who has experienced something horrible, but creating a space where they feel comfortable enough to share those details with you," Grimm says. "It's an honor. It can be difficult to hear their stories, but I try to put in the framework that by talking to me, they've taken the first step toward healing. This horrible thing happened. It can't be changed. But step one is talking about it." Grimm credits her passion for social work to her parents, who she says always had "incredibly generous hearts." From helping families that fell on hard times to buying Christmas presents for the underprivileged, Grimm says she has many memories of her parents' kindness and compassion throughout her youth. "Those values were instilled in me early on," Grimm says. "I thought I wanted to teach and actually started out as a choral music education major. But I learned that it was more the counseling aspect of teaching that I liked. So I got out of education and took some psychology and sociology classes. That's what ultimately lead me in the direction of social work." In her current position, Grimm has found herself on the front lines of some of the worst cases. In addition to counseling victims, Grimm also works with adolescents exhibiting high-risk behaviors—specifically illegal or inappropriate sexual behaviors. Grimm says many of the cases involve an older sibling exhibiting inappropriate sexual behavior with a younger sibling. In those cases, she often treats the entire family unit. "Treating the family as a whole is one of the most rewarding aspects of my job because I've had the opportunity to witness some incredibly powerful family reunification moments as a result of treatment," Grimm says. Grimm also wears the hat of "field instructor" for MSW students through the University of South Carolina. She enjoys supervising a group of two or three clinical advanced-placement students who are enthusiastic about their future in the field. Though the line of work can be difficult, Grimm says the people she works with make all the difference. "I couldn't ask for a better group," she says. "The personally and professionally supportive environment we have is what has built the resiliency we have as an agency." Growing up with a mom that was a nurse practitioner, Jennifer Hauptman always knew she wanted to help others. For a long time she thought she wanted to be in hospital discharge. And though she started out as a human development major, Hauptman ultimately found herself on the track for social work. After doing her internship in the medical field, she knew that's where she wanted to stay. What she didn't know is that the field would take her from Manhattan to a rural hospital in northwest Vermont where she would become the sole full-time social worker. "I feel privileged to be let into this tight-knit community," Hauptman says. "The culture here is that people don't ask for help. They don't let others know they're suffering. It's a farming mentality. So to have a sass-talking New Yorker like myself be welcomed into the community has been truly humbling." Hauptman says the region is plagued with mental illness, domestic violence, and opiate addiction, the latter of which has become so prevalent that it has received national attention. Though there are a lot of chronically ill people in the region, the access to medical care is often a challenge. Many residents literally live off the beaten path—down little dirt roads and far from the hospital. It's quite a different world from Hauptman's start at Bellevue Hospital in New York. Despite limited resources, Hauptman has come in and worked at turning around the floundering social work department. "It's not uncommon for hospitals not to value the social work role—and historically that was an issue here," Hauptman admits. "But it's really turned around. We're bringing a more professional social work presence to the hospital. We're making positive changes despite the challenges." Hauptman is currently working with a BSW student and she says the best piece of advice she has offered her is to "find your own identity as a social worker." She says it's something she tries to remember of herself each and every day. "I'm very proud of my identity as a social worker, but I'm also me," Hauptman says. "In social work, authenticity is the most paramount characteristic. That's how you relate person to person. I'm real and people appreciate that. Be yourself. Don't change who you are. And people will connect." Since getting into social work, Elaine Leader always had a dream that she would make a difference in this world; she just never knew how. That dream became a reality with the birth of TEEN LINE, a teen-to-teen hotline that has helped young people deal with life crises and even prevent suicides by connecting trained teens to those in need. According to Leader, it all started with an adolescent group she launched when she was hired at Cedars Sinai in the department of child psychiatry. "I told the director I wanted to start an adolescent group," Leader recalls. "He told me that starting a group like that was no small endeavor. It couldn't just be a weekly meeting, but would become something more encompassing—involving schools and families. In 1975, I launched that group and it is still running today. Within the group, we had a therapist facilitating the process, but I was intrigued by how adolescents were actually helping one another." That's where the idea for TEEN LINE was born. At the time, there weren't computers and cell phones, but Leader says the group has evolved with the times to keep up with these latest advances. Teens can now access resources through a website or by texting as well. And Leader knows that with the advent of cyberbullying these kinds of services may be more needed than ever. To date, nearly 2,000 high school students have been trained to answer calls, texts, and e-mails from peers who contact TEEN LINE. They deal with issues such as eating disorders, self-harm, depression, LGBTQ issues, and suicide. Calls come in not only from the United States but also from around the world. "TEEN LINE is saving lives across the globe," Leader says. "These services are needed more than ever—and that need only seems to continue spreading. Many teens are in crisis." Since the birth of TEEN LINE 35 years ago, Leader says it has been rewarding to watch it grow. She set out to make a difference, but never knew it would be saving lives. "TEEN LINE has been like having a baby and watching it grow," she says. "I'm proud of what we've accomplished." As the lead social worker at Karnes County Residential Center in Karnes City, TX, Olivia Lopez worked with women and children held in detention who were seeking asylum in the United States. Many of these women and children were held in detention for more than one year, and many were deported to their country of origin. Lopez worked with these families, offering stress management and women's health education groups as well as providing individual treatment to address their mental health needs. All were survivors of severe trauma, torture, and abuse, and many endured threats of death and human trafficking. But to Lopez's distress, she discovered the conditions in the detention and treatment center were often inhumane and had the effect of retraumatizing these individuals. As a result, she brought these conditions to the attention of Congress, where she testified. "It's one thing to say, 'These practices are unethical,' and leave," Lopez says. "But you have to be able to sleep at night. I resigned from the position, but then I didn't know who to call or what step to take. I followed the chain of command list but wasn't getting the response I needed. So I contacted the University of Texas' law clinic and met with an immigration attorney. Things moved from there and ultimately I was testifying before a panel in [Washington] DC." Lopez says it was frightening then and she continues to have concerns today. She knows that it has impacted her career and perhaps hurt any chance of being hired in private sector in the future. Today she is teaching social work at a junior college and hopes teaching will be her full-time future. While Lopez never set out to be a whistleblower and says the experience has been trying, she says she wouldn't hesitate to do it again. "I have no doubt that I did the right thing," Lopez says. "I believe in what I did and I would do it again." Lopez says the stories she heard from immigrants about their homeland were so awful that "even Quentin Tarantino couldn't make a movie that horrific." When these immigrants do make it safely to the United States, Lopez says she hopes their futures would be brighter. "The ideal for the future is closing down these detention centers and opening residential communities where immigrants can get some actual peace and some effective clinical work," Lopez says. "The litigation is still happening. This isn't something that changes overnight." For now, Lopez can have her own peace of mind that she did the right thing. "Social workers really are the first line," Lopez says. "And we can make a difference." As part of a high school shadowing program, Paul Milford was matched with a social worker who worked with very young children. Milford says that even as a young person, he knew it was what he was meant to do. He fell in love with the profession right then and there. "I thought, 'This is it!'" he remembers. "This is what I'm meant to do." In his current role, Milford works tirelessly to improve the health outcomes for his clients by facilitating collaboration among health care providers and empowering clients to take an active role in their health care. Milford knows how overwhelming the medical system can be—particularly for children who require a lot of medical care. "For our cleft lip and pallet clinic, for instance, there are eight different providers the family will see in one visit," Milford says. "What I try to do is coordinate among those providers. I make sure the family understands the information they're being given and find out if they feel there were things that weren't explained well or that they didn't understand." A big part of the work also involves working with patients who have infectious diseases such as HIV. With these patients, Milford performs typical psychosocial evaluations—finding out what the patients want to accomplish, what their needs are, and what they feel their future holds. Milford also works closely with the nursing staff to review cases and problem-solve. And he works closely with parents, who often need additional guidance and support. "When people find out what I do, they often say it sounds 'hard,'" Milford admits. "Or they say it sounds 'draining.' But to me it's just the opposite. It gives me energy. It's what gets me up in the morning. Kids are so resilient. Even with the adversities they face, I've found they are able to triumph over almost anything. That motivates me to keep going." At 11 years old, Diane Takvorian had to interview someone who held a career she was interested in. She chose a social worker. Takvorian can remember her grandmother driving her to City Hall and talking to a social worker. She says that experience helped shape her career path. "I definitely came out of that meeting thinking it would be something I'd like to do," Takvorian remembers. "Then in high school I got very involved in the civil rights movement and by college was involved in community organizing." As Takvorian became increasingly aware of the environmental impact of polluting industries on communities in her area, a role in environmental work became particularly clear. "These communities are dealing with substandard housing, poor access to jobs, and now on top of that their children are suffering from allergies and asthma because they are living in a polluted area," Takvorian says. "When my eyes were opened to what was going on, we started the Environmental Health Coalition as a bunch of volunteers who wanted to help. It just became really strong." In fact, the Environmental Health Coalition has become one of the largest environmental justice organizations in the country. From 2010 to 2013, Takvorian also served on the Joint Public Advisory Committee of the Commission for Environmental Cooperation, appointed by President Barack Obama. Takvorian is also the cofounder of the California Environmental Justice Alliance, which is a statewide coalition of environmental justice organizations that advocate at the state level for equitable policies that impact low-income communities of color. One of the organization's first successes under her leadership was to secure one of the first community Right-to-Know laws in the nation to help residents have information about chemicals that were being used and stored by businesses in residential areas. "One of the biggest problems in the communities I work in is 'incompatible land use practices,'" Takvorian says. "That means in most places you have residential, commercial, and industrial zones kept separate. But in the communities I work in, they're all mixed together. You could have a house next to a shipyard or a factory next to a school." Takvorian says the need for environmental justice work is only continuing to grow. "Young people can get involved now," Takvorian says. "A big part of our work is leadership development, and we have a curriculum online that young people—or anyone else—can use to train themselves to fight environmental injustice."